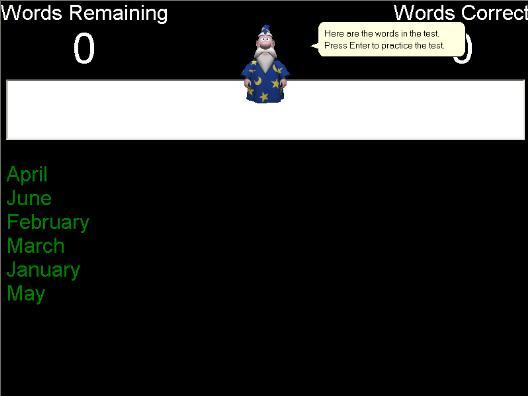 Articulate spelling allows you to practice your spelling at home. An animated character speaks the words for you to spell, and checks that you have spelled them correctly. This can be a great help for children with dyslexia. The educational version supports many users on a network, and automatically finds the correct test for a given student. It is also very easy to cut and paste the words from any textual source, to make it easy to add or share word lists. You can also use the program to practice a foreign language by selecting a speech engine for the corresponding country. It supports Danish, French, German, and Spanish as well as US and UK English. The program requres Microsoft Agent and a speech synthesis engine which are currently available for free on the internet, and an automated installation program makes them simple to install. The latest version also includes all of the winning words from 1925 until 2003 from the Scripps Howard National Spelling Bee. This site does not contain serial number, crack, keygen Articulate Spelling serial number : serial number is the simplest type of crack. A serial number(cdkey,product key,etc) is register the program as you may already know. a crack or keygen may contain harmful software. If you cannot find the exact version you want, just give it a try. for more information read .nfo/.txt/.diz file include in zipped file.